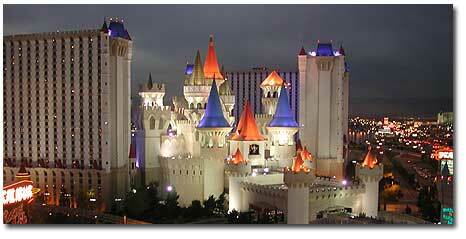 Las Vegas is located along Interstate 15 in Clark County of southern Nevada. Generally regarded as the gambling capital of the U.S., glitz is supplied in quantity by huge hotel/casino complexes, which offer inexpensive lodging and dining, as well as entertainment from glamorous stars. Las Vegas is also the gateway to Lake Mead National Recreation Area. Las Vegas, once an oasis en route to California, began as a Mormon settlement during the silver rush of the 1800s. It was revived by ranching in the 1850s. With the arrival of the Union Pacific Railroad in 1905, bars, gambling houses and other businesses sprouted in the downtown area. In 1931, during the Great Depression, a stampede of unemployed arrived in Las Vegas to work in the construction of Hoover Dam, on the nearby Colorado River. The hydroelectric marvel that was finished in 1936 now lights the neon signs for which the city is famous. That same year, state legislators allowed legalized gambling in Las Vegas. Immediately, casinos and hotels sprang up, transforming the city almost overnight. After World War II, huge resort/hotels began rising higher and higher on the strip, and with them, came world-class entertainment: the country's best collection of singers, dancers, musicians and comedians. Death Valley National Park: 85 miles west. Valley of Fire State Park: 45 miles northeast. Lake Mead National Recreation Area: 17 miles east. Red Rock Canyon National Conservation Area: Renowned for geological wonders, including sandstone escarpments in striking colors. 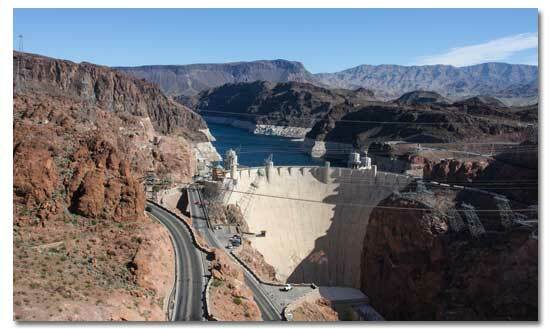 Hoover Dam: Highest concrete dam in the western hemisphere impounds Lake Mead. Moapa River Indian Reservation: Moapa Band of Paiute Indians occuppy 71,000 acres north of Las Vegas. Weather/Climate: Las Vegas receives an average 4 inches of rain and 250 days of sunshine a year. Temperatures are extremely hot May to October, over 100 degrees F. June through August, but humidity is extremely low. Hoover Dam viewed from the new bridge. Boulder City, Nevada: 25 miles south. Henderson, Nevada: 10 miles south. Bullhead City, Arizona: 96 miles south. Baker, Califonria: 93 miles west.